Home educators take pride in the fact that we violate some of the most sacred (often unwritten) rules of school – and we do it with gusto! Part 1 detailed the first 4 rules we like to eschew, in the efforts of giving our kids the most effective, individualized education possible. Although it can feel daunting to break out of the box when you embark on the homeschooling journey, it won’t take long before you begin to revel in the freedom of loosing the large-scale schooling chain of expectations and creating your own way – a path unique to your special student. Rule #5 – School must follow the traditional calendar, with summers off. 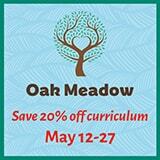 Welcome to the blessed flexibility of the homeschooling calendar, where there are no rules! Homeschoolers can follow the traditional September-May calendar, or they can deviate however they like. Many homeschoolers do academics year-round, so that kids don’t lose what they have learned over the summer. Doing so offers them the flexibility of taking breaks whenever it is convenient for them to do so – and take advantage of off-season prices for vacations! Spreading out academic work throughout the year offers homeschooling families less pressure in needing to “get it all done” within a certain time-frame. When illness, vacations, or spring fever hit, home educators can take time off from school without worrying that they are sacrificing essential teaching time over the long haul. Even those homeschoolers who tend to adhere to the traditional school calendar can modify their summer to include academically-oriented activities such as field trips or academic camps, so that learning doesn’t completely cease. Again, the moral of the homeschooling story is make the rules bend to your needs! Rule # 6 – Kids are best socialized by being around same-aged peers. Have to say, there might not be a rule that makes me happier to break than this one. I can’t ever quite figure out how this became an unofficial rule, anyway. I mean, even those who follow it tend to bemoan the vices that accompany it – bullying and student violence and drug use and sexting and disrespect toward adults and…well, it does make one wonder why we think 13-year-olds make the best social exposure for other 13-year-olds. Homeschoolers know the value of children spending the majority of their time around adults – responsible elders who love them and have their best interests at heart. Just as we would not leave our kids’ academic learning to their peers (because same-age friends do not have the wisdom or maturity to give each other what they need to be successful academically) homeschoolers do not believe same-age peers are capable of providing what our kids need to be socially competent. And, judging from the myriad social ills in every public school in existence, it’s pretty clear that many peers provide exactly the opposite – an education no parent wants their child to have. Many home educators gleefully break this school rule because they understand that providing children with the opportunity to engage with those of different ages, life stations, and backgrounds is tremendously beneficial for generating young adults who can interact effectively with the world around them – a world that is decidedly not, outside of a traditional school environment, comprised of people just like they are. Intentional efforts to surround young people with individuals from all walks of life, and to teach them how to engage effectively with them, provide the opportunity for students to learn respect for those more mature than they, tenderness for those younger than they, and the skills they need to function in a the real world – one that goes far beyond age segregation. Rule #7 – Students need to progress at approximately the same pace in each subject, and stay on grade level. To be honest, even though it’s an unwritten school rule, very few public school students live by it in actuality, either. I mean, come on. Who in this world is actually at the same place in every academic subject at any given time? The reality is that students progress at different paces in different subjects, because each person is better at some things than others. In a public school setting, where large groups of kids must be taught together, it is not possible to individualize each subject for each child. However, in homeschooling – kids can be free to be wherever they are! If they are whizzes at Math, they can work two grades “ahead”, if that’s where they need to be academically. Yet if they struggle with, say, reading, there is no “behind”; they simply progress at whatever pace necessary for them to learn effectively. Grade levels do not mean much in homeschooling; students move forward in each subject however slowly or quickly they need to. Many a homeschooling student is in different “grades” in multiple subjects! Violating this school rule means that learning will happen not according to a prescribed sequence for the masses, but according to the individual needs of each unique student. Rule #8 – Kids need testing in order to determine how they are doing academically. Testing is a bit of a craze in public school – so much so that many question the degree to which actual learning is being sacrificed for the process of putting a number on kids’ “knowledge”. Unfortunately, this proliferation of testing has not improved kids’ education. Although homeschoolers all handle this issue differently, many don’t test at all, beyond the standardized testing required by state law in order to be able to continue to homeschool (and in some states evaluations are an approved alternative for proof of progress). Because parents work one-on-one with their children, they intimately know each child’s academic strengths and weaknesses. Quizzes and chapter tests can provide good practice for students’ future academic career (especially if they will be attending college), but the information obtained from them can be just as easily determined from close monitoring of daily work, and periodic cumulative review. 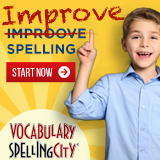 Homeschoolers tend to take the “less time testing is more time learning” approach. Research papers or essays, narration, science projects, and portfolios are other ways that homeschoolers track academic progress without the standard multiple choice, objective testing format. Although traditional tests have their place, homeschoolers understand that education is a holistic process that is much larger than simply the score on a fill-in-the-bubble exam. Kids’ intellectual performance is tied to factors that tests often do not measure effectively, such as self-discipline, creativity, emotional acuity, and motivation. Break this school rule of testing, and you might just discover that you gain a much more intimate knowledge of your child’s progress! I know it’s scary. I know you’re afraid of the potential consequences. I know it’s hard to imagine a world in which the school rules don’t reign supreme. But, know this – many have gone before you in their delinquency, and have been so very glad they did. So don your rebel hat, take a deep breath, and just do it. Thumb your nose at the school rules, and go your own way – the way that is specifically tailored to your unique student. In the end, you might just find that by doing so, you end up in a place of academic freedom – a place where your child not only receives an excellent education, but ends up loving learning along the way! I was homeschooled most of grade school, and I certainly didn’t stay at a similar “grade level” across subjects. in fact, I only learned to write well at all when taking concurrent enrollment community college classes as a junior and sevior, but got “ahead” in math and chemistry and by the time I graduated high school had done 3 semesters in college of calculus and chemistry that was enough to pass a CLEP test for credit for 2 chemistry classes. Two benefits of homeschooling seem in tension-the ability to have your children learn to work on their own, and the ability to spend one-on-one time with them. I got both, and found myself far ahead of most of my peers starting college. I owe it to my mom for taking responsibility herself for my education. 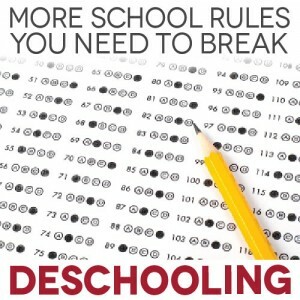 Deschooling sounds great and I would love to break some of the rules. I am into the third year of home schooling my 9 year old granddaughter. Unfortunately we live in Missouri. Missouri says we must get in 1000 hours from June 30th to July 1st of the following year. The first year we home schooled we were very relaxed with our hours believing we had plenty of time. Then about two thirds of the way in I was diagnosed with cancer. I had to have surgery and chemo. I was very ill and that caused us to miss a lot of school. We got very behind on our hours. What I’m attempting to say is that I can’t take chances with our hours. I must comply with the law. I can’t risk something happening as it did when I was diagnosed with cancer. We don’t know what the future holds. It would be great to only have school two or three hours a day. I just can’t risk it. We home school seven hours a day. Once we get close to getting our hours in then we can relax. I’m not complaining about Missouri’s home school laws. I’m grateful to live in a state where I have freedom from excessive oversight from the state. Missouri is probably one of the best states to home school.